On 17 October 2017, 500 Flight Centre Travel Group employees, or as they are known as internally, “Flighties” from all levels and from capitals all around Australia – Brisbane, Sydney, Melbourne, Hobart, Adelaide, Perth and Darwin – came together to set a WORLD RECORD for the most food relief hampers packed in a single day. Flight Centre Travel Group joined forces with Australia’s largest food relief organisation, Foodbank, in a world record hamper challenge to help families in need. The World’s Biggest Hamper Pack Challenge is a product of the long-standing relationship between the two organisations designed to break the world-record mark of 10,000 food hampers. And after weeks of fundraising, advocating, organising, and today actually packing the 10,000 hampers – the World’s Biggest Hamper Pack Challenge did indeed break the world record! Flight Centre customers were encouraged to join the challenge by making a $20 donation for a hamper while making their travel bookings at Flight Centre, Cruiseabout, Escape Travel, Travel Associates, Student Flights or My Adventure Travel stores around the country. “Foodbank is a wonderful organisation that works with the retail, manufacturing, and farming industries to provide 63 million meals to over 2,600 charities and 1,750 schools around Australia,” said Flight Centre Foundation’s general manager, Anita Russell. “It’s hard to believe hunger is at crisis point in the ‘lucky country’. It’s a predicament largely hidden by stigma and shame, but the reality is we’re all likely to know someone who is affected. As Foodbank says, it’s not just people on the street but people in our street,’’ she said. 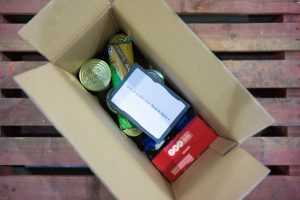 “A $20 hamper can make a big difference, filled with enough vegetables, meat and tinned goods to feed a family for a week,’’ Ms Russell said. “The charitable work Foodbank does for vulnerable Australians is perfectly aligned with the Foundation’s core philosophy of building brighter futures in the communities where it works, lives and travels,” Ms Russell concluded. Media enquiries to Anita Russell, General Manager Flight Centre Foundation. McKenna Moroz, Marketing & Communications Coordinator, Foodbank Australia.